Good morning guys! Today we're bringing you the Electrolux Save and Share Blog Series which is part of the Electrolux Delightful-E campaign which aims to help you save money and precious time by making everyday tasks simple and easy. Remember about my article here for saving just by washing clothes? Today, we get to ask Electrolux brand ambassadors about creative and effective ways to save household expenses, to ultimately share blessings to other people who enjoy their Electrolux appliances. 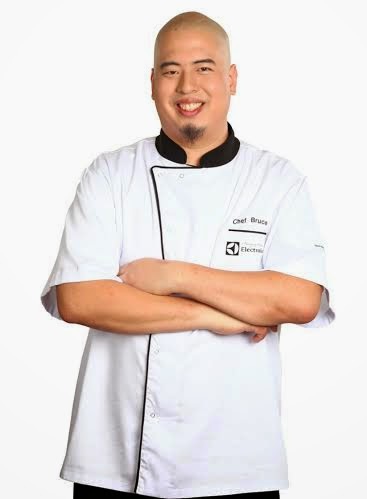 In this one, we get to talk to my favorite Chef in the world, Chef Bruce Lim and Mommy Mundo's Janice Villanueva about how they battle day to day's quirks. At home, just like you... we often think of ways on how to get bills taken cared of. Utilities comprise a big part of the budget and if you get to efficiently use it while lowering costs, you end up using the money you save on more important things. My water bill is crazy, so is electricity. I always end up complaining when I see the numbers at the end of the month when I should have done the deed while we were in the middle of everything. We asked Chef Bruce and Ms. Janice some simple questions to see how they do it and what they do to not have bill shock especially on regular things like utilities. They gave their two cents about how they do it in their homes, you can do this too. Listen up! Hi Chef Bruce and Ms. Janice! What do you do to ensure that utility bills (especially electricity and water) do not spike up? Chef Bruce says "I have a family of boys who get dirty a lot and they can change clothes up to 4 times a day. So I have to make sure that my appliances is energy saving like my Electrolux washing machine it has energy saving features that I love! My air conditioners are all Electrolux inverters that also help me save on the energy bill!". 1) Buy an energy efficient aircon by checking the EE rating, make sure you buy an aircon with capacity that matches the size of the room. 2) For the helpers, teach them how to keep the aircon filters clean, and how to turn the aircon on and off and set proper thermostat setting. 3) For the kids, teach them that airconditioners consume a lot of electricity so every hour you save from aircon use can be a big deal. Tell them for example that turning on the aircon at 7pm instead of 6pm everyday, will save you a lot when you multiply each day by 30 days in a month. Teaching kids is also based on age appropriateness- like for teens, you can teach them to use the timer already. For school age, teach them how to turn and set the thermostat knob to keep aircon energy efficient. For younger kids, teach them to use the fan when it’s possible and the aircon only when really really needed already. When talking benefits, you can even say that cost of that extra hour of aircon use amounts to the price of their favorite toy. Speaking in kids’ terms helps them understand better and allows them to be more involved." I see Chef Bruce, I too believe in technologies such as inverters would really make energy monster appliances like airconditioners to be efficient. Imagine how much you would be able to get if you use them almost everyday. Inverters make aircon compressors only work when you have already achieved the specific comfort and coldness. It can get you at least 30-50% cheaper on the regular bill because it consumes less power. Even if it costs more, you get some kind of return in investment because of the savings you get from it. Pretty neat stuff. Ms. Janice also made some points on the value of teaching kids how much they spend on electricity. Some simple things and adjusting specific times on when to turn appliances ON and OFF or when needed is key. I delved more on on that part on my second question. Since you are both parents, do you find it important to share the value of savings to your kids? If yes, how do you do it? At what age is it best to start introducing the value of money and saving? Any tips on how other parents can creatively do this to their kids? Chef Bruce says "Yes, as early as you can. I always explain to my boys about the value of a buck. I teach them about not wasting food and how to make use of the leftovers. Like a roast chicken will be dinner then breakfast will be a chicken sandwich and snack time will be chicken noodle soup. My family and I all have reusable water bottles, we stay in one room when its play time so we use just one air conditioner. Piggy banks are the way to go as well. So all the change I have in my pockets goes into a family piggy bank. Then when its full I we change it in the bank and I show them how much we saved. Then it becomes a play day with daddy!" Ms. Janice adds "Like in anything, early education is important. Making saving a habit and instilling this in our kids early is the first step towards their financial wellness. The most basic is to open a bank account for them. If they are of age, involve them in this process. Bring them to the bank with you, show them how you fill up the form and deposit slip, give their money to the bank teller and show them their passbook. Money gifts from birthdays and Christmas make good seed money for their first junior savings account. Show them how their money earns interest every month. Then every time they get money gifts or their weekly allowance, provide them with healthy reminders and prompts to make them decide to keep the money in the bank than to spend it. Besides this, you can also have concrete activities to provide a bit more “instant gratification” and let them reap rewards of saving money. When my kids want a new toy and we will not buy it for them because there is no special occasion, they will save up for the toy and earn money by saving their allowance in school, doing chores at home (we have a rate card for different chores), make crafts to sell to their lolas, uncles and aunts and our family friends and even at some of the mini markets/ bazaars that I organize. They also sometimes work at our kid-friendly events as staff and earn an allowance which they also put in their savings fund." You get it fresh from these people who live pretty successful lives. It does matter when you've got your family involved in using appliances efficiently and have savings off of it whether you are an advocate of using electricity and water like they do. I learned quite a lot just by asking them a couple of questions and got answers just like what experts do. They want you to have the same things they enjoy while hoping you'll live life to the fullest at your homes. It's easy if you get to know how to integrate key Electrolux appliances too. To know more, please follow @ElectroluxPH on Twitter and Instagram. Or like their channels below. You can start early, trust me it's easy!